I traveled with Tower7 to Santa Barbara. Traveled with John Singer to SD. SanOPalooza. There was also the time with Neon, B_K and CraigK at SanO. Any other AS'ers there? Spring 2001 - Sayulita, Mexico. Tripped with one other alt.surfer, Craig Kemnitz. We tripped down to Mainland Mexico with our families. The surf wasn't fantastic, but we had lots of fun. We even paid a fisherman to take us out to a "mysto" break that was impressive (for the setup, anyway). PontoPalooza - San Diego - June-July 2001. [Taken from Rod's report.] PontoPalooza, hosted by Joanne VanMeter and her husband Don. Shared water time with Joanne, Dan "Crag" King (he was trying out a standup board! ), Rod Rodgers and Ben Rak (just back from Cabo). Admiring our efforts from the shoreline were Bill Andrews, Terry Hendricks (sdbchguy), a recovering George Barnes and Mike Lietzow; and, various family and friends: Ray & Laura (Joanne's family); Dan King's friend (Dan is one lucky guy! ); George's wife and younger daughter; Ben Rak's friend Roy; and Joanne's surfin' chick friend, Leslie. August 2002 - Huntington Beach. 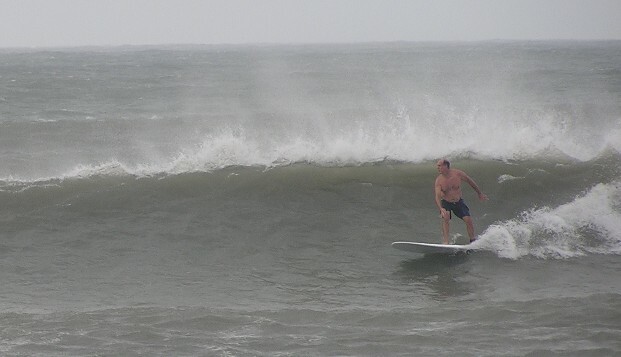 Surfed with Jose Borrero. We met up at Huntington Beach, south of the pier with former poster tower7. The waves were fun, but inconsistent. I got some good ones, including a really good freefall to faceplant on a nice set wave. July 2003 - San Diego. George Barnes hosted an excellent slide show on a mysto South Pacific island and the Galapagos trip (George and Carson) that was attended by several ASers: Carson, Rod, and sdbchguy. GuidoPalooza 2005 (Sept 10-17, 2005). This year's GP trippers included KC Filer, Neal Carver, Myron, DaGriz, Rick Miale, PaipoJim, Rod and Tom Duncan. Non-ASer guests included the wives of KC, Rod and Tom Duncan. See the GP2K5 Trip Reports and Pics and a pic of several in the group. During GP-Extended, PaipoJim and Rod drove down to the DelMarVa before sunrise, surfed Assateague, and then went over and shared stories and refreshments at the FoonBunker. The next day PaipoJim and Rod caught waves in mid-Ocean City, along with fellow-GP'er Gile Cook, continuing the Ophelia Fest started down on the OBX.